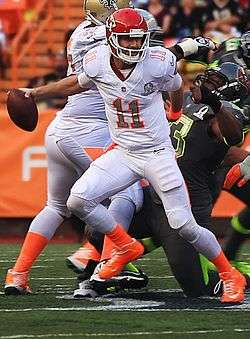 For more information on Chiefs quarterbacks, see History of Kansas City Chiefs quarterbacks. The Chiefs have had 33 starting quarterbacks in their franchise's history. Cotton Davidson was the team's first starting quarterback; he played all 14 games for the Texans in their inaugural 1960 season. Davidson played with the franchise from 1960 to 1962, and was traded in 1963 to the Oakland Raiders. Len Dawson signed with on July 2, 1962 and played for the franchise for 14 seasons. With Dawson as the team's starter, the Texans/Chiefs won three American Football League championships and appeared in two Super Bowl championship games. Dawson was named Most Valuable Player after the Chiefs' victory in Super Bowl IV and retired in 1975 with several franchise records. Three future Pro Football Hall of Fame enshrinees played for Kansas City: Dawson, Joe Montana, and Warren Moon. 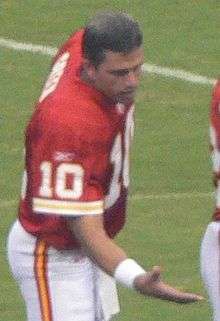 In the 2008 season, the Chiefs started three quarterbacks: Brodie Croyle, Damon Huard, and Tyler Thigpen. After Croyle and Huard were sidelined by injuries, Thigpen played in eleven games, winning one and losing ten. In 2009 and 2010, Matt Cassel started 15 of 16 games each season, while Croyle started the other 2 games. Matt Cassel's 15 starts in 2009 were the most for one Chiefs starting quarterback since Trent Green's complete season in 2005. Tyler Thigpen was the third different starting quarterback for the Chiefs in the 2008 season. Damon Huard (left) and Brodie Croyle (right) split the starting quarterback duties in the 2007 season. The number of games started in the season by each player is listed in small parentheses. Statistics do not include post-season starts. These quarterbacks have the most touchdowns in the Chiefs history. a : Since the 1978 NFL season, all teams have played 16-game schedules. b : Strikes by the National Football League Players Association in the 1982 and 1987 seasons resulted in shortened seasons (9 and 15-game schedules, respectively). d : Replacement quarterbacks Matt Stevens, Frank Seurer, and Doug Hudson started for the Chiefs alongside Kenney and Blackledge following the NFL Players Association strike in 1987. For the only time in team history, five different quarterbacks started in 1987 following the player's strike. e : By Week 3 of the 2008 season, Brodie Croyle, Damon Huard, and Tyler Thigpen had all started one game each. Both Croyle and Huard suffered injuries in their respective starts in Weeks 1 and 2. Thigpen started the Chiefs' Week 3 game against the Falcons, Huard started in Weeks 4 and 5. Croyle returned to start in Week 7 and suffered a season-ending knee injury. Both Croyle and Huard were placed on injured reserve following the game, leading to Thigpen's second start, against the Jets in Week 8. Thigpen was the starting quarterback through the remainder of the season. 1 2 3 4 5 6 7 8 9 10 11 12 13 14 15 16 Gretz, Bob (2003-09-12). "Thinking about quarterbacks". Kansas City Chiefs. Archived from the original on September 30, 2007. Retrieved 2008-07-19. ↑ Gretz, Bob (2006-11-01). "Quarterbacks and controversy". Kansas City Chiefs. Archived from the original on September 30, 2007. Retrieved 2008-07-19. 1 2 "Cotton Davidson". Pro Football Reference. Sports Reference LLC. Retrieved 2008-07-19. 1 2 "This Week in Chiefs History". Kansas City Chiefs. 2007-07-06. Retrieved 2008-07-19. ↑ "This Week in Chiefs History". Kansas City Chiefs official website. 2007-08-10. Retrieved 2008-07-19. 1 2 3 4 Associated Press (2008-09-08). "Chiefs QB Croyle out for this week". National Football League. Retrieved 2008-09-12. ↑ Williamson, Bill (2008-06-18). "Several '08 picks should make immediate impact". ESPN. Retrieved 2008-07-19. 1 2 "Chiefs' Huard replaced by Thigpen after injury". Associated Press. 2008-09-14. Retrieved 2008-09-14. 1 2 3 "Chiefs QB Thigpen to start vs. Falcons". Associated Press. 2008-09-17. Retrieved 2008-09-17. 1 2 3 Associated Press (2008-10-19). "Chiefs QB Croyle sprains right knee, done for the season". ESPN. Retrieved 2008-10-19. ↑ "2016 Kansas City Chiefs season". Pro Football Reference. Sports Reference LLC. Retrieved 2016-10-14. ↑ "2015 Kansas City Chiefs season". Pro Football Reference. Sports Reference LLC. Retrieved 2015-09-13. ↑ "2014 Kansas City Chiefs season". Pro Football Reference. Sports Reference LLC. Retrieved 2015-01-01. ↑ "2013 Kansas City Chiefs season". Pro Football Reference. Sports Reference LLC. Retrieved 2013-09-10. ↑ "2012 Kansas City Chiefs season". Pro Football Reference. Sports Reference LLC. Retrieved 2012-10-02. ↑ "2011 Kansas City Chiefs season". Pro Football Reference. Sports Reference LLC. Retrieved 2011-09-11. ↑ "2010 Kansas City Chiefs season". Pro Football Reference. Sports Reference LLC. Retrieved 2010-09-29. ↑ "2009 Kansas City Chiefs season". Pro Football Reference. Sports Reference LLC. Retrieved 2009-09-17. ↑ "Tyler Thigpen". Pro Football Reference. Sports Reference LLC. Retrieved 2008-11-10. ↑ "2007 Kansas City Chiefs season". Pro Football Reference. Sports Reference LLC. Retrieved 2008-07-19. ↑ "Brodie Croyle". Pro Football Reference. Sports Reference LLC. Retrieved 2008-07-31. ↑ "2006 Kansas City Chiefs season". Pro Football Reference. Sports Reference LLC. Retrieved 2008-07-19. ↑ "Damon Huard". Pro Football Reference. Sports Reference LLC. Retrieved 2008-07-19. ↑ "2005 Kansas City Chiefs season". Pro Football Reference. Sports Reference LLC. Retrieved 2008-07-19. ↑ "2004 Kansas City Chiefs season". Pro Football Reference. Sports Reference LLC. Retrieved 2008-07-19. ↑ "2003 Kansas City Chiefs season". Pro Football Reference. Sports Reference LLC. Retrieved 2008-07-19. ↑ "2002 Kansas City Chiefs season". Pro Football Reference. Sports Reference LLC. Retrieved 2008-07-19. ↑ "2001 Kansas City Chiefs season". Pro Football Reference. Sports Reference LLC. Retrieved 2008-07-19. ↑ "Trent Green". Pro Football Reference. Sports Reference LLC. Retrieved 2008-07-19. ↑ "2000 Kansas City Chiefs season". Pro Football Reference. Sports Reference LLC. Retrieved 2008-07-19. ↑ "Warren Moon". Pro Football Reference. Sports Reference LLC. Retrieved 2008-07-19. ↑ "1999 Kansas City Chiefs season". Pro Football Reference. Sports Reference LLC. Retrieved 2008-07-19. ↑ "1998 Kansas City Chiefs season". Pro Football Reference. Sports Reference LLC. Retrieved 2008-07-19. ↑ "1997 Kansas City Chiefs season". Pro Football Reference. Sports Reference LLC. Retrieved 2008-07-19. ↑ "Elvis Grbac". Pro Football Reference. Sports Reference LLC. Retrieved 2008-07-31. ↑ "1996 Kansas City Chiefs season". Pro Football Reference. Sports Reference LLC. Retrieved 2008-07-19. ↑ "Rich Gannon". Pro Football Reference. Sports Reference LLC. Retrieved 2008-07-19. ↑ "1995 Kansas City Chiefs season". Pro Football Reference. Sports Reference LLC. Retrieved 2008-07-19. ↑ "1994 Kansas City Chiefs season". Pro Football Reference. Sports Reference LLC. Retrieved 2008-07-19. ↑ "Steve Bono". Pro Football Reference. Sports Reference LLC. Retrieved 2008-07-31. ↑ "1993 Kansas City Chiefs season". Pro Football Reference. Sports Reference LLC. Retrieved 2008-07-19. ↑ "Joe Montana". Pro Football Reference. Sports Reference LLC. Retrieved 2008-07-31. ↑ "1992 Kansas City Chiefs season". Pro Football Reference. Sports Reference LLC. Retrieved 2008-07-19. ↑ "Dave Krieg". Pro Football Reference. Sports Reference LLC. Retrieved 2008-07-31. ↑ "1991 Kansas City Chiefs season". Pro Football Reference. Sports Reference LLC. Retrieved 2008-07-19. ↑ "Mark Vlasic". Pro Football Reference. Sports Reference LLC. Retrieved 2008-07-31. ↑ "1990 Kansas City Chiefs season". Pro Football Reference. Sports Reference LLC. Retrieved 2008-07-19. ↑ "1989 Kansas City Chiefs season". Pro Football Reference. Sports Reference LLC. Retrieved 2008-07-19. ↑ "Ron Jaworski". Pro Football Reference. Sports Reference LLC. Retrieved 2008-07-19. ↑ "Steve Pelluer". Pro Football Reference. Sports Reference LLC. Retrieved 2008-07-31. ↑ "1988 Kansas City Chiefs season". Pro Football Reference. Sports Reference LLC. Retrieved 2008-07-19. ↑ "Steve DeBerg". Pro Football Reference. Sports Reference LLC. Retrieved 2008-07-19. 1 2 "1987 Kansas City Chiefs season". Pro Football Reference. Sports Reference LLC. Retrieved 2008-07-19. ↑ "Matt Stevens". Pro Football Reference. Sports Reference LLC. Retrieved 2008-07-31. ↑ "Frank Seurer". Pro Football Reference. Sports Reference LLC. Retrieved 2008-07-31. ↑ "Doug Hudson". Pro Football Reference. Sports Reference LLC. Retrieved 2008-07-19. ↑ "1986 Kansas City Chiefs season". Pro Football Reference. Sports Reference LLC. Retrieved 2008-07-19. ↑ "1985 Kansas City Chiefs season". Pro Football Reference. Sports Reference LLC. Retrieved 2008-07-19. ↑ "1984 Kansas City Chiefs season". Pro Football Reference. Sports Reference LLC. Retrieved 2008-07-19. ↑ "Todd Blackledge". Pro Football Reference. Sports Reference LLC. Retrieved 2008-07-19. ↑ "1983 Kansas City Chiefs season". Pro Football Reference. Sports Reference LLC. Retrieved 2008-07-19. ↑ "1982 Kansas City Chiefs season". Pro Football Reference. Sports Reference LLC. Retrieved 2008-07-19. ↑ "1981 Kansas City Chiefs season". Pro Football Reference. Sports Reference LLC. Retrieved 2008-07-19. ↑ "1980 Kansas City Chiefs season". Pro Football Reference. Sports Reference LLC. Retrieved 2008-07-19. ↑ "Bill Kenney". Pro Football Reference. Sports Reference LLC. Retrieved 2008-07-31. ↑ "1979 Kansas City Chiefs season". Pro Football Reference. Sports Reference LLC. Retrieved 2008-07-19. ↑ "Steve Fuller (American football)". Pro Football Reference. Sports Reference LLC. Retrieved 2008-07-31. ↑ "1978 Kansas City Chiefs season". Pro Football Reference. Sports Reference LLC. Retrieved 2008-07-19. ↑ "1977 Kansas City Chiefs season". Pro Football Reference. Sports Reference LLC. Retrieved 2008-07-19. ↑ "Tony Adams". Pro Football Reference. Sports Reference LLC. Retrieved 2008-07-31. ↑ "1976 Kansas City Chiefs season". Pro Football Reference. Sports Reference LLC. Retrieved 2008-07-19. ↑ "1975 Kansas City Chiefs season". Pro Football Reference. Sports Reference LLC. Retrieved 2008-07-19. ↑ "1974 Kansas City Chiefs season". Pro Football Reference. Sports Reference LLC. Retrieved 2008-07-19. ↑ "1973 Kansas City Chiefs season". Pro Football Reference. Sports Reference LLC. Retrieved 2008-07-19. ↑ "1972 Kansas City Chiefs season". Pro Football Reference. Sports Reference LLC. Retrieved 2008-07-19. ↑ "1971 Kansas City Chiefs season". Pro Football Reference. Sports Reference LLC. Retrieved 2008-07-19. ↑ "1970 Kansas City Chiefs season". Pro Football Reference. Sports Reference LLC. Retrieved 2008-07-19. ↑ "1969 Kansas City Chiefs season". Pro Football Reference. Sports Reference LLC. Retrieved 2008-07-19. ↑ "Mike Livingston". Pro Football Reference. Sports Reference LLC. Retrieved 2008-07-19. ↑ "1968 Kansas City Chiefs season". Pro Football Reference. Sports Reference LLC. Retrieved 2008-07-19. ↑ "Jacky Lee". Pro Football Reference. Sports Reference LLC. Retrieved 2008-07-31. ↑ "1967 Kansas City Chiefs season". Pro Football Reference. Sports Reference LLC. Retrieved 2008-07-19. ↑ "1966 Kansas City Chiefs season". Pro Football Reference. Sports Reference LLC. Retrieved 2008-07-19. ↑ "1965 Kansas City Chiefs season". Pro Football Reference. Sports Reference LLC. Retrieved 2008-07-19. ↑ "Pete Beathard". Pro Football Reference. Sports Reference LLC. Retrieved 2008-07-31. ↑ "1964 Kansas City Chiefs season". Pro Football Reference. Sports Reference LLC. Retrieved 2008-07-19. ↑ "1963 Kansas City Chiefs season". Pro Football Reference. Sports Reference LLC. Retrieved 2008-07-19. ↑ "Eddie Wilson". Pro Football Reference. Sports Reference LLC. Retrieved 2008-07-31. ↑ "1962 Dallas Texans season". Pro Football Reference. Sports Reference LLC. Retrieved 2008-07-19. ↑ "Len Dawson". Pro Football Reference. Sports Reference LLC. Retrieved 2008-07-19. ↑ "1961 Dallas Texans season". Pro Football Reference. Sports Reference LLC. Retrieved 2008-07-19. ↑ "Randy Duncan". Pro Football Reference. Sports Reference LLC. Retrieved 2008-07-31. ↑ "1960 Dallas Texans season". Pro Football Reference. Sports Reference LLC. Retrieved 2008-07-19. ↑ "Hunter Enis". Pro Football Reference. Sports Reference LLC. Retrieved 2008-07-31. ↑ "NFL History by Decade, 1971–1980". NFL.com. Retrieved 2009-02-02. ↑ "NFL History by Decade, 1981–1990". NFL.com. Retrieved 2009-02-02. ↑ "Kansas City Chiefs History–1980's". Kansas City Chiefs. Archived from the original on 2008-05-01. Retrieved 2008-07-19. ↑ "Johnson will not play for second straight week; Thigpen to start at QB". ESPN. Associated Press. 2008-10-23. Retrieved 2008-10-24.